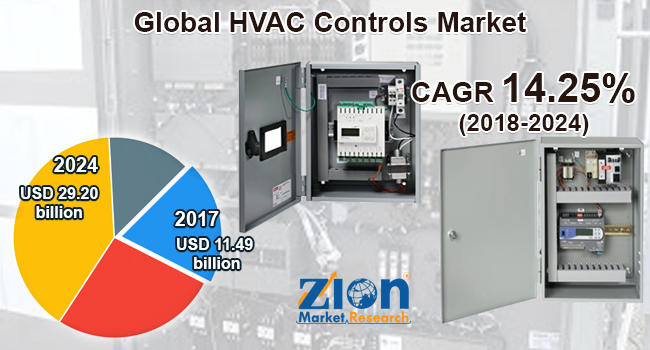 Zion Market Research has published a new report titled “HVAC Controls Market by Application (Industrial, Commercial, and Residential), by System (Humidity Control, Temperature Control, Integrated Control, and Ventilation Control), and by Component (Sensors and Controllers & Controlled Devices): Global Industry Perspective, Comprehensive Analysis, and Forecast, 2018 - 2024”. According to the report, global HVAC controls market was valued at approximately USD 11.49 billion in 2017 and is expected to generate around USD 29.20 billion in revenue by the end of 2024, growing at a CAGR of around 14.25% between 2018 and 2024. The rapid technological advancements coupled with digitization are expected to propel the growth of the market for HVAC controls. The growth and development of this market are majorly driven by the capability of HVAC controls to work in extreme conditions. Additionally, the declining sensors’ prices and the integration of IoT in the HVAC controls are further fuelling the growth of this market. Furthermore, the concept of energy management techniques through wireless modular devices in smart buildings will positively impact this market’s growth. These devices eliminate in-house airborne contaminants, such as volatile organic compounds, unpleasant odors, etc. and provide clean outdoor air. The growing demand for building automation systems and the increasing implementation of smart devices will increase the adoption rate of HVAC control devices in the upcoming years. Several government initiatives toward clean, green, and sustainable environment will lead to the growth of smart buildings in both urban and semi-urban areas. These factors are expected to drive the HVAC controls market growth during the forecast period. On the basis of application, this market is classified into industrial, commercial, and residential. The commercial segment will dominate the market in the upcoming years due to the development of smart cities and other commercial spaces across both urban and semi-urban areas in developing nations, with a focus mainly on minimizing energy consumption and increasing energy efficiency. Based on the system, the HVAC controls market can be segmented into temperature control, integrated control, moisture control, and ventilation control. Integration control segment is expected to dominate the market. This due to the fact that integrated control systems allow better functioning of HVAC controls as these controls offer customization. On the basis of the component, the HVAC controls market can be classified into controllers and controlled devices and sensors. The controlled devices and controllers segment is expected to dominate the market, as these devices are responsible for the operations of the HVAC control systems. These devices receive user input and function accordingly. North America is anticipated to grow with the highest growth rate in the global HVAC controls market in the forecast years. The region will probably continue with its regional dominance over the forecast period. The growth of this regional market can be attributed to the improved infrastructure and ongoing technological advancements. The advent of less energy consumption in every building space coupled with increased efficiency will fuel the growth of this regional market. Europe is projected to contribute a substantial revenue share in the global HVAC controls market. Government regulation for efficient and effective energy consumption coupled with increased penetration of techno-buildings in this region will boost the growth and development of the global HVAC controls market across the world. Some key players of the global market for HVAC controls include Honeywell International, Siemens, Lennox International, Emerson Electric, Johnson Controls, Schneider Electric, Ingersoll Rand, Delta Controls, Azbil, and Mitsubishi Electric, among others.